Flynn Nagel sprints away from a Nebraska defender. The senior wideout currently leads the Big Ten in receiving yards. Things haven’t always gone smoothly for Flynn Nagel. He didn’t get his Northwestern scholarship offer until the brink of National Signing Day. His freshman campaign was truncated by injury. He fell into a funk at the start of his junior year, costing him a key role on special teams. On each occasion, however, the senior receiver steadily built himself back up. His strong fundamentals and tireless work ethic have manifested into eye-popping numbers midway through his final season in Evanston: Nagel leads the Big Ten in catches and receiving yards. He’s outpacing other standout Northwestern receivers of years past and providing quarterback Clayton Thorson a major outside option, made especially important by Wildcats’ struggles to run the ball. Nagel accentuated his strong play with a massive game against Nebraska last Saturday. His 12 catches and 220 receiving yards easily surpassed his previous career highs; the latter figure was the most yardage for a Big Ten receiver in five years. In many respects, it was the loud announcement of Nagel’s arrival as a standout receiver, one that came despite a hardscrabble path that always seemed to follow him. It began in 2013, when coach Pat Fitzgerald didn’t have a scholarship for Nagel — who watched two older brothers play for the Cats — until his commitment to Duke was nearly made official. It didn’t take long for Nagel, a high school standout in south suburban Lemont, to meet his next challenge. Receivers coach Dennis Springer praised his physical and mental preparations as a freshman and he appeared in the first five games of the season, only to suffer a season-ending injury. Indeed, Nagel bounced back quickly. He earned a starting job as a sophomore, and finished the year second on the team in both catches and yards. He was NU’s primary punt returner, and dabbled in kick return too. And he entered 2017 as the Cats’ leading returning pass-catcher, a player praised for his consistency who could marshal an expansive core of capable receivers. But that didn’t pan out in the season’s early going. He struggled to make an impact in September games, and true freshman Riley Lees became the primary punt returner. Nagel passed the exam. He had a career-best 87 receiving yards and a third-overtime touchdown in the upset win over Michigan State, and rebounded from his September lull to again finish first on the team in catches and second in yards. Soon after that season ended, Nagel began “embracing” the final winter workouts of his college career. Though he may not have suddenly developed flashy, newfound skills, his work off the field and deep connection with Thorson have contributed to his leap forward, Springer said. The numbers have borne out that preparation. He recorded the first two 100-yard games of his career against Duke and Michigan State. His 622 receiving yards through six games eclipses the midseason tallies of Austin Carr and other NU pass-catching standouts. Fitzgerald hinted that the 5-foot-11, 195-pound Nagel could get a chance to play in the NFL. Against Nebraska a week ago, Nagel jolted the Cats’ heroic, game-tying drive in the final moments of regulation with a 32-yard catch over his shoulder. 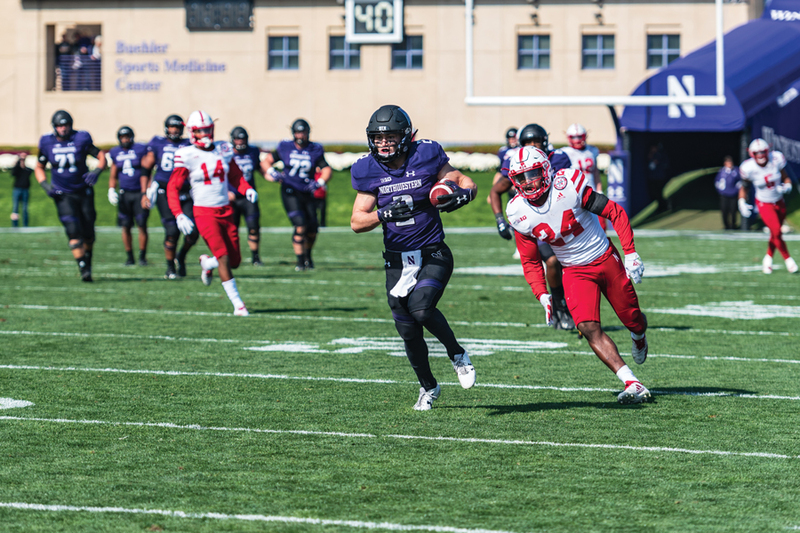 The grab moved NU into Cornhuskers’ territory, and underscored the impact Nagel, four years after barely making it to Evanston, is having in his final games.